TG has teamed up with the folk at Abbey Road to give you the opportunity to win a bunch of new merch from the legendary recording studios. 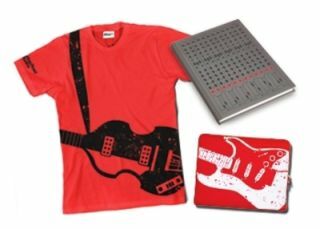 The winner will receive a soft laptop case (rrp £20), a mixing desk notebook (rrp £10) and a t-shirt with a twin guitar design (in red, XL; rrp £25). One runner-up will receive a soft laptop case. To enter, just head to the dedicated competition page and answer the following question. Which British legends released an album named 'Abbey Road'? For the full range of Abbey Road Studios goodies, head over to www.abbeyroad.com/shop. PLEASE NOTE: Under 18s must obtain parental consent to enter this competition and be able to demonstrate this to Total Guitar's reasonable satisfaction. Images not to scale.